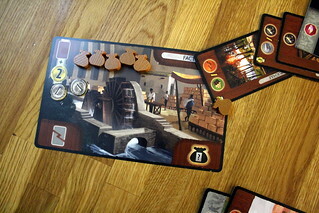 7 Wonders: Babel, the newest expansion, treads on a middle ground. It consists of two independent expansion, Tower of Babel and Great Project. Tower of Babel mixes the game up completely while Great Projects – well, okay, Great Projects still adds something new, but it changes the game less than the tower does. Both expansion module have in common that they add an element to 7 Wonders that is shared by all players, giving you new ways to interact with the other players. Lets look at Great Projects first, because it’s closer to basic 7 Wonders. The Great Projects are big endeavors that all civilizations can contribute to and profit from. They are represented by large cards, and you get one per age to work on. Contributing to the project does not disrupt your regular activities, you do it on top of playing your regular card for the round. To contribute, you have to play a card of the right color and pay a small price, mostly coins but sometimes also goods that have to be still unused for this round. Participating in the project lets you take a Participation Token. There is always one per player, and if all tokens are taken by the end of the age, the Great Project is completed. Whether the project is complete or not decides what effect the tokens have. If the project remains unfinished, every player without a participation token receives a penalty, for instance lose a card of a given color, lose all coins or lose the production from their wonder board for the rest of the game. Players with a Participation Token get nothing if the project isn’t finished. On the other hand, if the project is finished all Participation Tokens are exchanged for Reward Tokens that let you build a card or a stage of your wonder for free or increases the score for sets of Science symbols. Or you could just get a bunch of coins. And yes, you can get more than one Participation Token and receive the reward multiple times. Someone else will be empty-handed then, but at least there’s no penalty if the project is finished. Great Projects doesn’t make 7 Wonders significantly more complex. What it does, however, is make money more important. Participating in projects always costs some coins, so trying to get by with little or no money is a certain way to receive some penalties. Great Projects also adds some more interaction to the game. You’ll want to consider the projects contribution card color when passing cards, possibly denying your neighbor some Participation Tokens. If you then play those cards without contributing to the project yourself, you can force its failure. That’s a useful strategy in some cases, either to deny other players the reward or even to cause a penalty that hits them harder than you. A good example of that is destroying a green card when you have a single clay tablet an your neighbor has five cogs. The penalty will cost you one point, but he loses nine. Situational, sure, but something to keep in mind. Tower of Babel is the more complex of the two modules, and the one that lets you mess more with your opponents, more than ever before in 7 Wonders. Before the first age, each player receives three Babel Tiles which are drafted much like the cards: you keep one, pass the other two along to your left, keep one of the two two tiles you received from your right, pass the remaining one along, keep the last tile you receive. Every player ends up with three tiles, and would do good to remember which tiles passed through his hand, too. 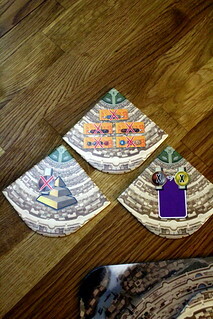 The Babel Tiles can be played to the shared Babel Board. To do that, you have to discard a card instead of using it for one in one of the three traditional ways (Building, Wonder or discarding for money). When you do, you put one of your tiles on the Babel board. Each tile shows an additional rule that remains in effect for all players while the tile is visible. Those rules can be very beneficial, they can for instance reward you with coins for building certain things, make constructing your Wonder cost no resources or give you an infinite amount of every raw material (brown cards) that you produce with a one-icon resource card. On the other hand, there are some Babel rules that will really mess up your game, adding a tax to certain cards, making some yellow cards unusable or, and this one is nasty, cancelling the production from all brown cards with more than one icon. Those rules don’t stay active forever. The Babel board has only three or four spots, depending on the number of players, and when they are all full you start covering old tiles with new ones, building the tower in a spiral. That is the only way to get rid of unfavorable rules, but not the only incentive to play the Babel tiles. There’s also the simple fact that playing your tiles is worth up to ten points at the end of the game, that’s not a bad reward for messing with the other players. 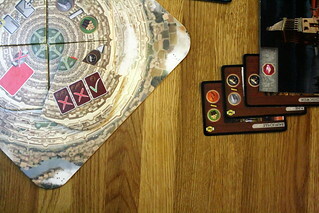 Tower of Babel is a very interactive expansion, as 7 Wonders goes. You still won’t trade or negotiate with other players, but you will have to keep a close eye on what they are doing, because they can really ruin your day with their Babel tiles – or make your day, if you can take advantage of their beneficial rules. Through the tile drafting, you know some tiles that are in the game, and you might guess some others from their owners’ actions. Is Gizeh just not building the resources needed for the 20 point Wonder? Then maybe he’s waiting for the right time to make building Wonders cost nothing, you might bet on that for your own Wonder. As fun as playing with the Tower is, it must also be said that it makes the game harder to control and may sometimes unbalance it. For instance, cancelling the production from all brown cards with more than one icon can be devastating if you couldn’t know that tile was in play. After all, avoiding those cards just in case is not a solution, either. Mostly, the tiles even out, but sometimes one player doesn’t get a fighting chance. Once you mastered both modules on their own, you can put them together and play with Great Projects and the Tower of Babel. While that’s a bunch of fun, it’s something I’d only recommend to experienced players, because it can get confusing. Between Babel rules and the rewards and penalties for Great Projects, there are many things to consider, and inexperienced players might take a long time making a decision, slowing down the beautifully quick 7 Wonders. 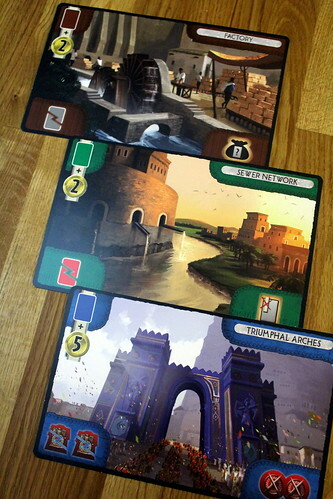 That’s something great about 7 Wonders: Babel: it adds new mechanics to 7 Wonders, but they barely slow down the game. After a first game to get the new rules, you’ll be playing as quickly as ever, but with new things to consider and new strategies to explore. It does lose a little of the amazing simplicity of 7 Wonders, but on the other hand it gains a little interaction. That’s a fair trade, as far as I’m concerned. Now, if you would enjoy Babel depends on what type of expansion player you are. If you want your expansions to mix up the game, then I can probably stop talking at this point, you’re already sold on the idea. If, on the other hand, you only wanted more of the same, then Babel is not quite that. It does change some things, it does force you to reconsider your options. It is, however, a very fun way to mix up 7 Wonders, and I found it worth to come out of my expansion comfort zone and play it.